All working Zalando discount codes, vouchers and offers for April 2019 are shown below. At Zalando, 'the UK's largest online wardrobe', you can shop for shoes, clothing and accessories from internationally renowned labels such as Vero Moda, Adidas, United Colours of Benetton and Diesel. They stock a carefully curated range of brands, from well known and established ones like French Connection, to up-and-coming ones such as Samsoe & Samsoe and Tibi. Their all inclusive website allows you to completely develop your personal style from the comfort of your own home, cherry picking the very best pieces from all your favourite labels, rather than being restricted to one. For example, team a new pair of Levis 501s with some Kurt Gieger loafers for a practical look that works in all seasons, day or night; integrate a new shirt from Ted Baker to lift the outfit for drinks; which you can then combine with a suit from Tiger Of Sweden for work. The site is also easy to navigate, ensuring that you can find exactly what you are looking for quickly. Choose to search by brand and/or by clothing category, within which you can hunt for more specific items. 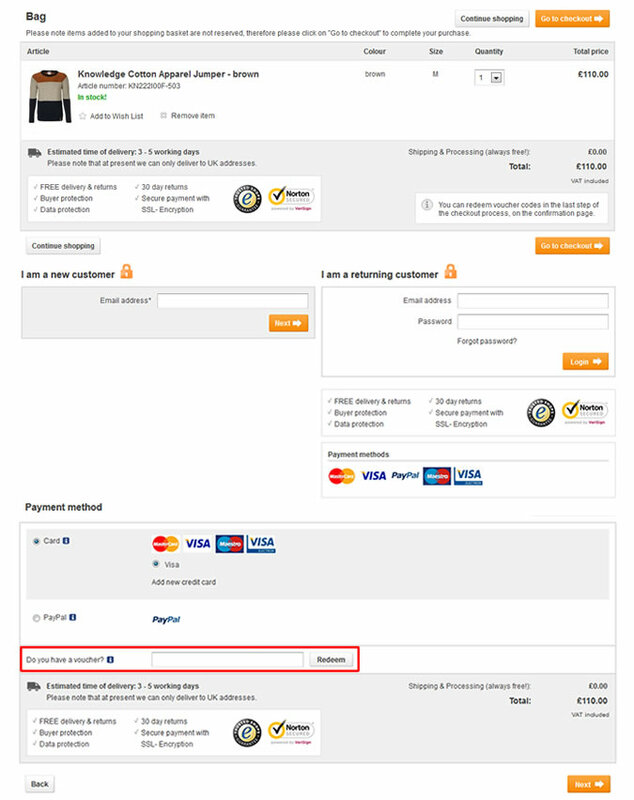 Organise your search to suit your budget by setting your price range on the adjustable budget meter, and search only for clothing/shoes in your size to avoid disappointment. Zalando often give away vouchers that offer free returns or free delivery, allowing you to essential try before you buy. When you sign-up for their newsletter, you can save yourself £5 off your purchases when you next shop. This, coupled with their already great sales discounts, will help you to look stylish all year round for less. Zalando further reward you the more you spend – vouchers frequently run that offer £10 off when you spend more than £50 on an order, or £15 reductions when you spend over £75. These type of offers usually run 3-4 times a year, for limited periods only - so make sure you check back regularly! Offers promoting their own Zalando brand items are also a great way to save some money – usually around 25% off in flash sales throughout the year. Individual lines are sometimes promoted, too, which could save you money on specific staple pieces you have needed for a while but couldn't afford to splash out on.